Poet’s new collection explores racial prejudice, offers challenge to readers. Lynn Watt’s memoir of her part in our struggles with Jim Crow, “On Wings of Song,” is that rare book of poetry that is a page-turner. I began it about 9:30 and by the time she had been arrested, thrown (with her two babies) into jail and escaped with her family the clock was approaching midnight. Although Molly uses the first person, these poems are not about her or heroism, rather in them she bears witness to what, if it happened to her, happened to many others and, by extension, to all of us. Her poetry provides an opportunity for us to contemplate our history and ask ourselves, given current events, what we need to do to meet the challenge of her witness. brakes screech the bus halts. The driver calls out black or white? She continues, in poetry as lucid and compelling as those opening verses, to acquire a family, train in Vermont at the Putney School, and to set off to Tennessee with an integrated group to start a summer work camp for the legendary Highland School. They barely arrive before they are terrorized at 3 AM by a deputized mob and thrown in jail. The legal resolution and their escape back to Cambridge are worthy of Kafka. So, my friends, how shall we meet the challenge of these poems? Order On Wings of Song now! "Local writer releases a lyrical memoir of the Civil Rights Movement"
… flies over Democracy's strange and bitter crop; a Baltimore Postman delivers the news: Read All About It! … is a journey into the heart, the place of deep caring for the state of being human. 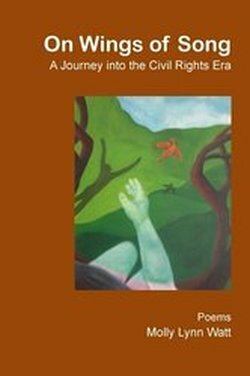 Watt has written with the sincere and sympathetic hand to mark a path for the reader to return to the Civil Rights Era of the 50's and 60's, a history that never leaves us. As she writes, there is no time for fear. In the inscape of her journey we see the time for caring is now. These are gentle but sure lines of conviction, lines worthy of a standing applause. … foregrounds one family’s experience against a choral background of history scored for multiple voices, both lyrical and documentary. Out of what she calls a minor episode, Watt has created a major contribution to our emotional understanding of the Civil Rights movement. You will find this account both informative and deeply moving; you will not be able to put it down, except to ponder what you have just read. … offers an important reminder that history isn't just an abstraction. Like a play narrated by multiple characters, these poems show the profound impact the ongoing struggle for Civil Rights had on the lives of ordinary people. With grace and skill, and a fine-tuned ear, the poet illuminates the tragedies and triumphs of America's march toward the still-elusive goal of racial equality. Ultimately this collection is testimony to the dignity and resiliency of the human spirit. … is a deeply moving memoir rendered in a collection of poems. It is an account of the vicissitudes of a courageous woman and her young family in the context of the social and political turmoil that transformed the United States in the latter half of the 20th century. Her unflinching recovery of the intimate details of their day-to- day lives as they journeyed through the racial strife of the 1960s is a stellar achievement. Repulsed by the whites only imperative in Tennessee, Watt engages in a long skirmish to end Jim Crow. Her poems sing songs to freedom’s beat. … explores a subject that most white and African-American poets avoid; but race, guilt and atonement are an important aspect of American history, brought to light with considerable clarity and truth. … does a marvelous job juxtaposing the personal with the political to reveal the ways those worlds intersect.